NRG Expert has gathered hundreds of statistics on the natural gas market to reveal the latest natural gas trends in the United States. The statistics reveal thought-provoking information concerning natural gas production and consumption levels as well as import and export numbers. Looking directly to NRG Expert’s Gross Natural Gas Consumption statistics, it has been found that consumption figures sharply increased from 2010-2012 by 3,279.54 billion cubic feet. Meanwhile, natural gas production figures also increased by 2,214.11 billion cubic feet. Natural Gas Production and consumption levels remained almost parallel until 2007 when a noticeable change occurred sending consumption levels down gradually and production levels increasing steadily. This trend continued until 2010 when consumption vastly increased. With Natural Gas Production increasing, exports have increased. Looking at NRG Expert statistics it has been revealed that export levels are very gradually increasing again, with the sharpest increase beginning in 2010. Between 2010 and 2012 export levels of natural gas increased from 1,136.61 to 1,806.43 Billion Cubic Feet. An overall increase of 669.82 Billion Cubic Feet in just two years. Imports on the other hand seem to be decreasing. Import levels peaked in 2007 before beginning a gradual decline. Funnily enough at the same point, exports began a gradual incline. In 2012 import levels were recorded at 3431.10 billion cubic feet, the lowest since the peak in 2007. 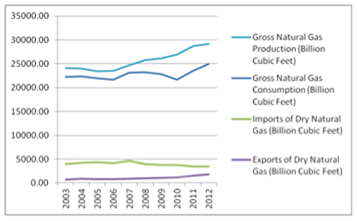 But in 2012 imports for natural gas still continued to be double exports. If the US want to be more self sufficient then imports need to reduce further. NRG Expert is a London and Toronto based energy market research publisher, providing energy data on over 200 countries. NRG Expert offers the most comprehensive database of global fuel generating capacity, and future power forecasts to 2020. This comprehensive database provides detailed information on fuel reserves, fuel generation and new and existing power plants. NRG Expert also provide in depth statistics on the natural gas market, click here for more information..